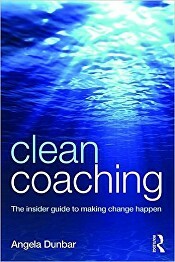 Published by Routledge and available from 4th Oct 2016, this book offers a really in-depth look at using Clean within a coaching context, for just £24.99. Angela celebrated the long awaited launch of this book with both an in-person traditional book launch party and and online ‘virtual’ launch. This was hosted by the very beautiful “Cantley House Hotel” in Wokingham, Berkshire. Guests mingled and shared a glass of bubbly and canapes before some informal speeches and toasts, firstly by Lynne Cooper and then Angela herself. 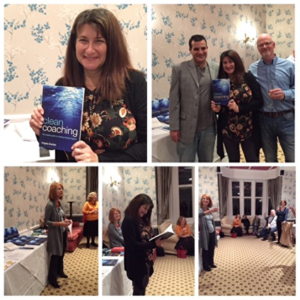 As well as Angela’s book, a selection of other Clean / Coaching books were available to look at and purchase, courtesy of the authors who had kindly come along to support this event. Angela read a couple of short extracts from her book before signing a number of books with personalised messages to all those who have meant so much to her over the years leading up to this publication. On Fri 28th Oct the ONLINE book event took place, for those who couldn’t attend the physical get-together in Wokingham. We had two worldwide ‘Zoom’ video calls at different times of the day, and all toasted a glass together, from various places around the world. Angela gave her thanks to some key people who have supported her along her journey to having this book published. Angela also shared an excerpt from the book and everyone joined in to share their experience of Clean / Angela herself as well as ask some Clean questions to draw out some more stories. On the morning call, James Lawley and Penny Tompkins were able to attend and share their experience too, including a story about David Grove and his early work with Emergent Knowledge. Email coach@angeladunbar.co.uk with any questions or feedback about the book or the launch events. 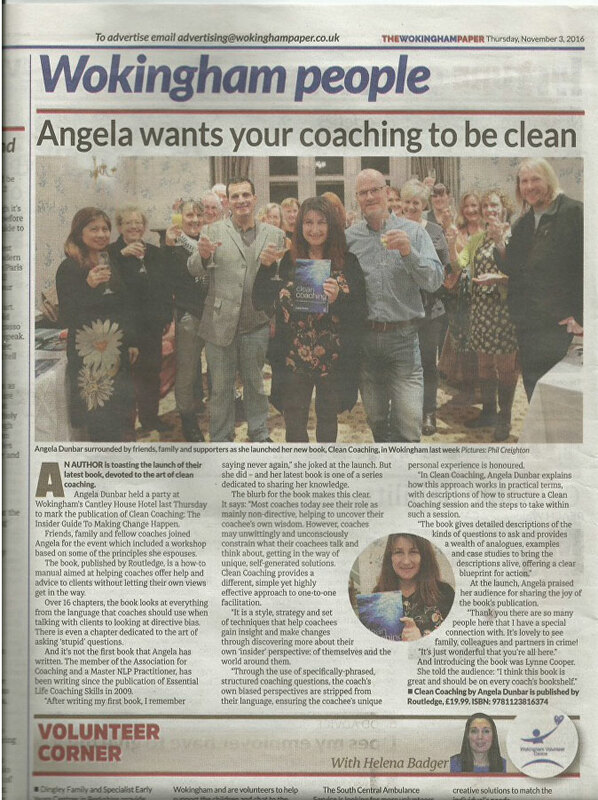 The launch followed an experimental workshop on Clean Coaching for Health, Healing and Creativity – which took place at Angela’s home during the day.